The fall running season is here and I couldn't be more excited! I kicked off my fall schedule with running in the 2nd Annual Woodrow Wilson Bridge Half Marathon. I had run this race last year and had a blast running it again this year. This year's race had extra meaning because I had coached some of the runners participating in the event through my running club's (DC Road Runners) half marathon training program. Race morning was a bit on the cool side for early October, with temperatures not even topping the 50s. For me, perfect conditions! Before the start, I managed to find a few of my trainees and chat with them for a bit. In fact, I ran the first two miles alongside one my trainees, which was nice. Based off how my track workouts and long runs were going, I felt I had a good opportunity to break my current half marathon personal record (PR) (1:41:46) I had set back in the fall of 2009. So, my race strategy was to go out at about an 8 minute mile pace for the first couple of miles and then depending on how I felt, start adjusting my pace. The race course is one of the most gorgeous courses the metro DC area offers. The course is point-to-point, starting down in historic Mt. Vernon (home of George Washington) and finishing at the National Harbor. The first few miles of the race went really well for me and I established a nice rhythm. The cool breeze in my face was refreshing, the views of the Potomac off to my right were beautiful and I found myself getting lost among all the trees that lined the course. There comes a point in a race where I decide whether or not I want to commit to challenging my PR. At mile 5, I made the decision to commit to my race plan. This decision is always exciting and scary at the same time. It's exciting because I love the trill of challenging a PR. But, it's also scary because I know I'm about to push my limits and enter what I like to call, "uncomfortable running." I define uncomfortable running as pushing yourself to the edge of your lactate threshold, but not over... because if you go over, it's game over. No PR. Try again next time. Uncomfortable running is a balancing act, really. It's allowing yourself to enter into that zone of discomfort, but not taking off more than you can chew. Yea, it's gonna hurt...but, if you play the balancing game right, your reward is a new PR. Miles 6 through 10 went pretty well for me and I was able to average about a 7:30 minute mile pace. Every now again I would develop a small stitch in my side, but slowing down my breathing and taking in some deeper breaths helped rid them. 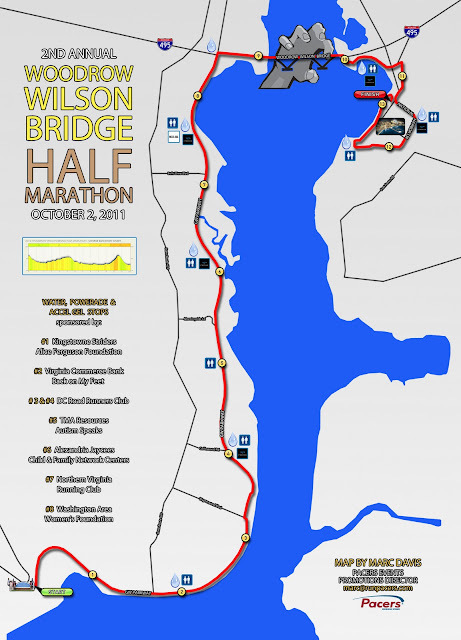 Mile 8 is when you reach the Woodrow Wilson Bridge. When you hit the bridge, there is about a third of a mile incline you must run up before you reach the crest of the bridge. While the climb up the bridge isn't too steep, the length of it makes it a bit challenging. You reach the crest of the bridge right after the mile 9 marker. When I got to the downhill portion of the bridge, I tried to increase my pace a bit, but my legs weren't having any of that. The mile 10 mark was right after the bridge crossing. Remembering from my race experience last year, all that stood between me and the finish line was a pretty substantial climb of about 125 feet during mile 11. The hill at mile 11 was definitely difficult to get up and added a nice challenge to the end of the race. When I got to the top of the hill, my legs felt like jelly and I was a bit concerned that I may not be able to recover and push hard to the finish. When I crossed the mile 12 marker, I took a quick peak at my watch to see what my total time was. I was just a hair under 1 hour and 31 minutes. At the pace I was running, I realized that I was on track to beat my PR. Then, I got to thinking. If I could cover the next 1.1 miles remaining in the race in under 9 minutes, I could finish under the 1 hour 40 minute mark. Game on! I pushed like hell during mile 12, but I was starting to cramp up. The 1:40 mark was quickly approaching and I wasn't sure if I was going to make it or not. The way the finish area was set up, the finish line didn't come into view until you practically crossed it. Once I did see it, I checked my watched again and realized that I was going to make it just under the 1 hour 40 minute mark! 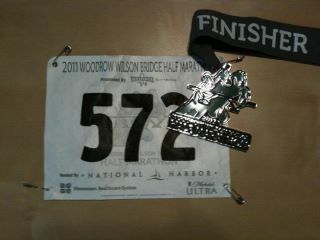 When I finished, I was spent but completely overjoyed. I had given it all I had out there. Ask any runner what their favorite thing is about racing and I'm sure most will say it's setting a new PR. I hung out near the finish line after I was done and was able to watch some of my trainees finish. I know four of them set new PRs, two by default as this was their first half marathon. For me, that was the icing on the cake. I had really enjoyed coaching these guys and I couldn't of been more happy to hear that they had such positive races! My official finishing time was 1:39:47 and I placed 250th out of 2,791 runners. Looking ahead, my next race is the Marine Corps Marathon at the end of the month. My half marathon effort has given me a lot of confidence going into Marine Corps. I think topping my marathon PR I set back in March is a very realistic goal for Marine Corps. I hope the running gods are on my side again then! Running isn't complicated, is it?